When it's sunny, I like to spend part of my day puttering around outside and often it's the time that I would have spent in my studio. Today was one of those days. I potted up a tomato plant that didn't seem to be in a good spot, weeded a bit and trimmed a few low hanging branches from the hedge. 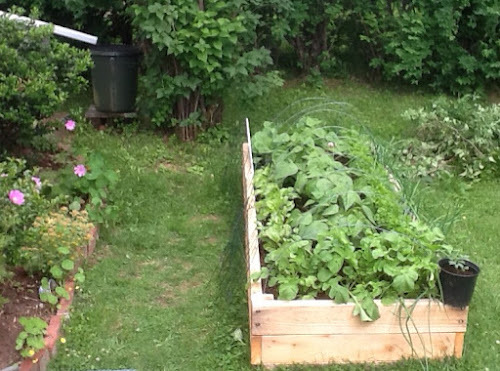 The raised bed has completely filled out. I've been picking radishes and must look for a recipe. I saw one for refrigerator pickled radishes on the net that I think I'll check out. Everything in the yard has filled in after the rain. The pots on the deck are coming along too. I've got pots of lettuce growing in various stages. On rainy days and rest times, I've been doing lots of mindless, meditative knitting. I've been enjoying it so much that I started a third baby afghan. I'm still trying to figure out the colour layout of the swoon block. 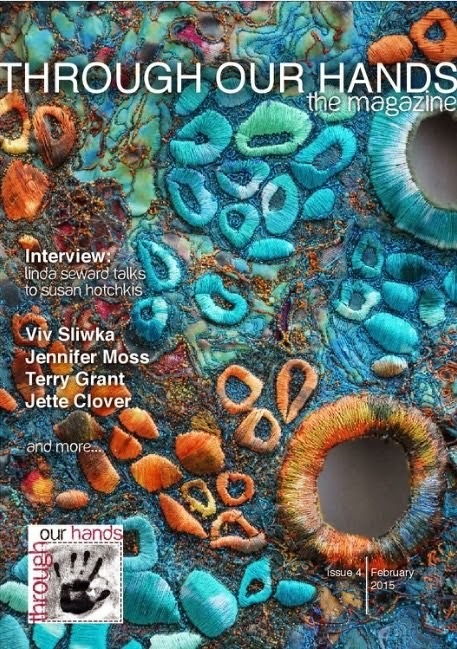 Organic fiber art comes more naturally to me. 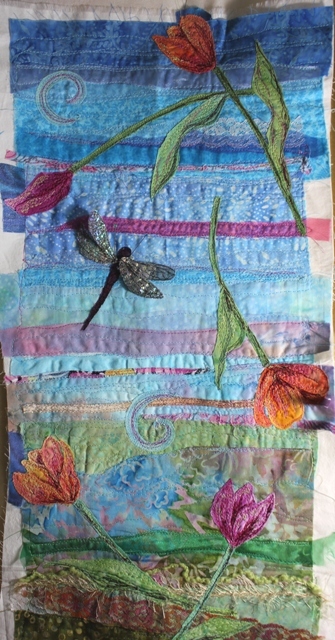 Picturing finished geometric quilt block pieces is difficult; where as, I can picture most of my fiber art in my head. Once I get started, I can see obvious things like in the Swoon block below. I'm going to change the color of the inner star points. I need to get one block together so I can move it to a project box for quilting days and get back to my art. When I've finished a few gardening chores-- spreading compost, gathering rhubarb, weeding-- I retreat to the cool house and set myself up in my corner of the living room. 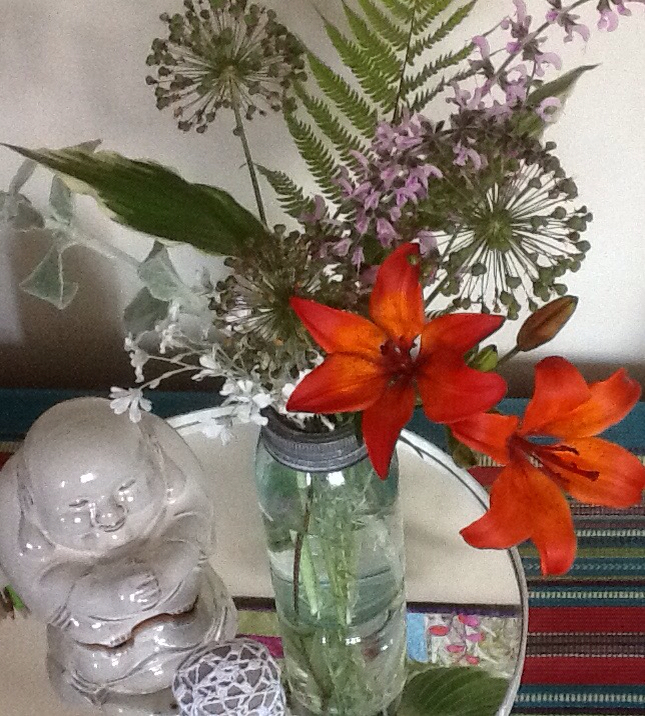 And a fresh bouquet to cheer me. With a snack of ice tea and a muffin, I set myself up with an ice pack on my hip and make sure I have all my projects nearby. Just ike with my fiber art, I always have a few knitting projects on the go. I'd really like to get to a sewing project, but I must rest the hip. It's good to have lots of interests to pass the time. I just have the hardest time to stay focused! 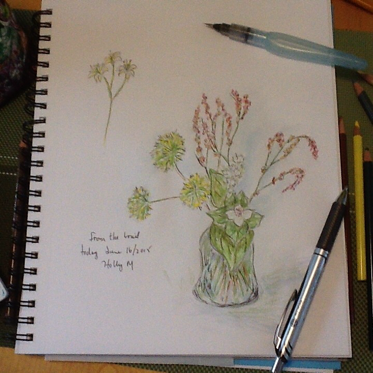 I want to garden, I want to work on my fiber art, and then there's sketching. On top of that I've been taken with the Swoon blocks that have been allover the internet recently. I have some fabrics I've been collecting that I think would make a nice quilt for my mother. At first, I was looking for something quite easy, as I usually do, but pictures on Pinterest of the Swoon block were occupying my mind and playing 'what if?'. Go look it up on Pinterest. Beware though; it may captivate you! There are so many versions out there. Isn't this one beautiful? No wonder I must try it! I found that I needed to draw a sample out onto the graph paper in my book. Even now I still can't decide on the arrangement of the areas of color. I've also started to cut out a few pieces and piece them to get a feel for how it's going to work. 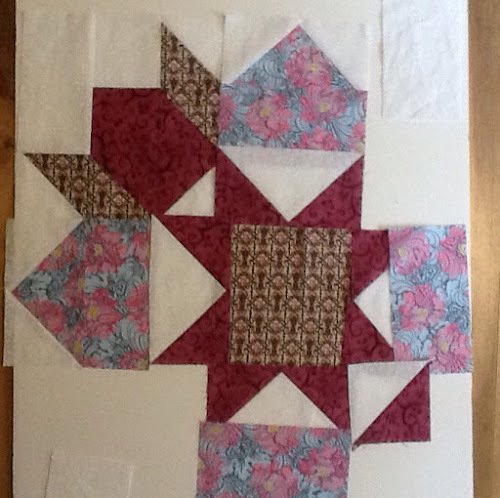 I want to get at least one block done so that I can have it in my project box ready for when I need a traditional sewing project. This is just the center part. There is still another row to go around. Today, it's been sprinkling off and on. Stubborn as I am, I managed to get the line of clothes dry by putting them out, bringing them in, and putting them back out again. Crazy, huh? 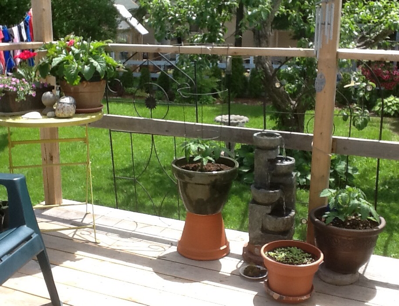 I love to be in my sewing room and at my machine where I can view my raised bed, the garden and the clothesline. It makes me happy. My tulip hanging is progressing slowly. I did another hour or so on the thread painting of the tulips. I keep my sketches and specimens handy for reference. The heavy stitching , despite the stiff interfacing, is causing the more scantily stitched background to buckle. I'm somewhat confident that I'll be able to stitch it out. You can really see it in the pic below. It's a learning process, isn't it? I must have moved the tulips around dozens of times before I finally committed to the arrangement and I'm still not happy! In my down times, I've been knitting away, finishing 2 baby blankets from my stash. I'm slowly sewing the ends in. 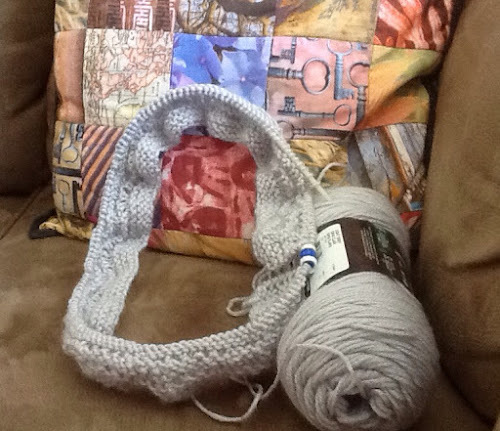 Of course, I can't go a day without something new on the needles. 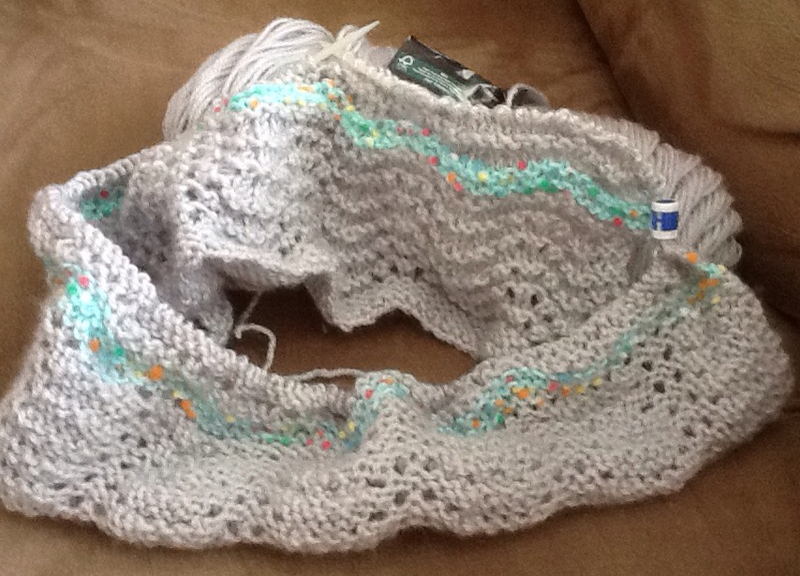 I started this Spiral Staircase shawl using a ball of Boboli Lace yarn by Berroco that I picked up on my last day trip. I downloaded the pattern from Ravelry but could not figure it at all. A member of my Facebook knitting group came to my aid. The pattern really isn't written right clearly, but with her clarifications, it was easy. If I find it easy, it really is! Yesterday was a rainy day and today a grey day which I don't mind because I really wanted to get a sewing job done for my husband and get back to some fun stitching. I've also gotten some much needed housework done. I vacuumed downstairs a bit this morning in the cold room and the central room. I did one load of wash and mopped one floor. Then, I felt free to come into the sewing room this afternoon. I've finally got my tulip piece all ironed and under the needle for some thread painting. I used a bit of medium and a lighter orange so far. I really like this stage when the images start to come alive. 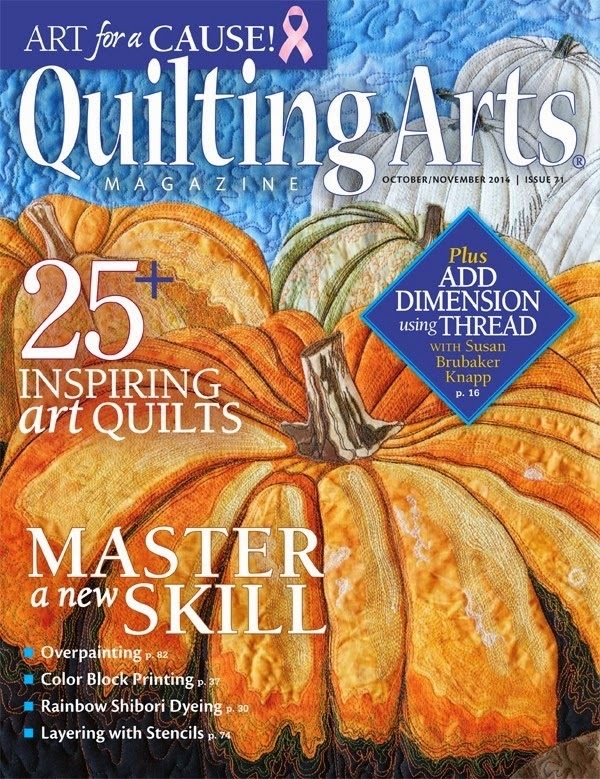 Typically, I do some thread painting and then I back the piece with batting and do some final quilting. Today was the perfect day! Warm, with a nice breeze, enough to keep the flies away. 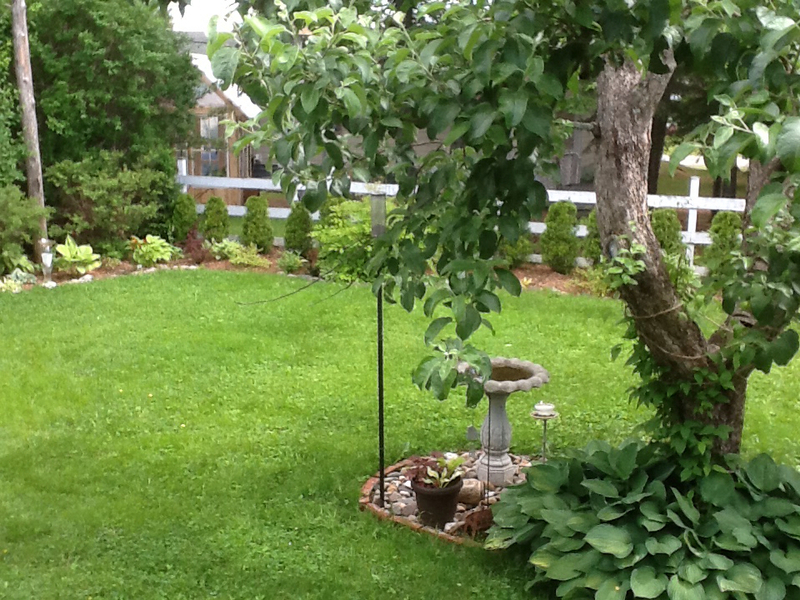 They are lessening now as summer solstice approaches and it is comfortable to sit out on the deck swing. I've slowly cleaned up and mulched the gardens. I love the view as the plants flush out. 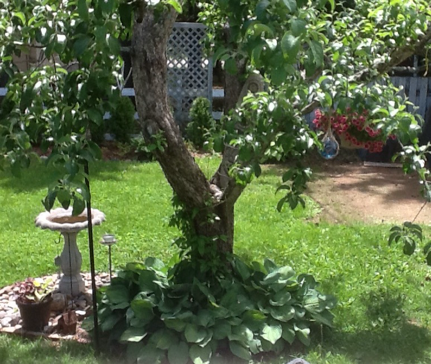 It's fun to watch the birds at the feeder and the bird bath. My large container garden is growing fast. I've been eating radishes. I'm going to have to search for some radish recipes. 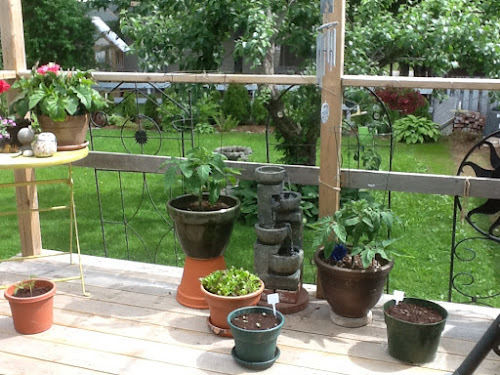 I've used several pots on the deck for tomatoes, lettuce and peppers. 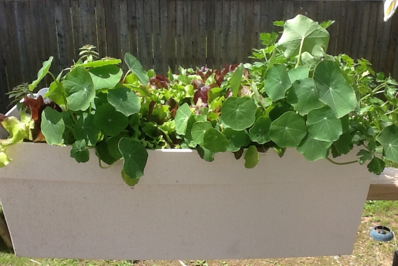 I even filled the railing box with lettuces Which I've already been snipping, nd a few nasturtiums in the front. After lunch, I took my tea out to the swing along with my sketching supplies. Lots of things to sketch. Just when I was moving to putter a bit around the garden, my husband came and asked if I wanted to go golfing. I didn't join this year because of my hip problems but I thought I might be able to do a few holes with the cart. It turned out to be the perfect afternoo-- breezy, not too warm, and not busy. I managed pretty well. I'm sitting now with ice packs all around the joint, but feeling very satisfied. I couldn't have asked for a better day. Supper was a half a shelled lobster with a side of steamed vegetables. I hope all of you, my readers, are having an equally lovely Saturday. A day with predicted showers turned out to be only a cloudy day. Late this afternoon, I headed out on the trail with my bike and picked a few wild flowers along the way. It is just starting to rain now. I've found the two on the right-- the reddish one- Sheep Sorrel and the one below it- Bunchberry. I remember Sheep Sorrel from my wanderings as a child. I bet there'll be a reader out there who can identify the others. I heard from a reader on the one off by itself, top left. In my book it is called Bluebead Lily. I've already forgotten the proper Latin name. I'm loving the acid free gel pen that I picked up while on an errand at Staples.pen. It is fine and very smooth. One can use it with a very light touch. Last night ,I took my bicycle for a little spin on the nearby trail, taking my camera and some bug stuff along just in case. Of course, I had to stop and take some pictures, and when I was quickly swarmed by mosquitoes I whipped the fly dope out and applied it. It never fails, every time I go, there is something new to see. I've been searching for these in my reference book but haven't found them yet. 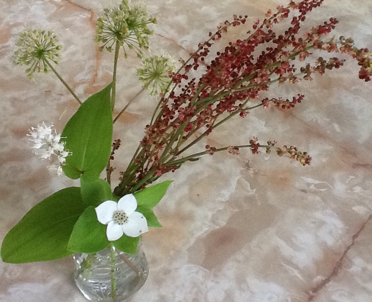 If the wildflowers are plentiful, I like to pick a few for my bouquets. I found some forget-me-not too. In the last few days, we've had a mother and baby robin in the yard. At this stage it is out of the nest but can't fly very far, and so it relies on it's camouflage to hide amongst the shrubbery. It managed to get itself perched upon the edge of the wheelbarrow where it stayed for some time watching the mother collect grub.Balancing was a bit precarious. This morning, my friend, Sue and I took a little trip out to a small fabric shop where I found a piece of some white tone-on-tone that I want for a new quilt project. I even found some nice percale which I like for fabric painting and printing. It is a tighter weave fabric that holds lots of stitching without stretching or distorting too much. I intended to head out to the garden after lunch as it is a breezy, sunny day--just right to keep the bugs away. First, I headed into my sewing room though to make some final adjustments to my fusible backed tulips. Ha, an hour and a half later, I was still there, although I finally said enough, and ironed it all down. Final decision. It's ready for the thread painting part of it now. The fun part! The wings will not be stitched fully down, just attached at the thorax so they will float above the piece. For supper, I've a small lobster in the fridge. I made up a rustic potato salad and that will be my supper-- simple, but oh so yummy. Oh, I also steeped a green tea at the same time to which I added fresh lemon and some honey. 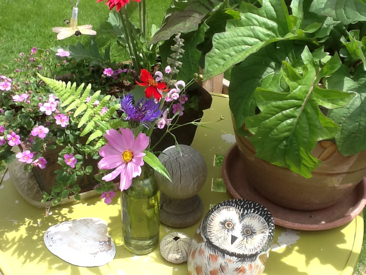 So, I think, right now I'm heading outside for a bit to plant a couple of new additions to the back border garden. I hope you're enjoying a pleasant weekend. Even though I seem to think I'm pretty slow moving (I fell asleep right after breakfast 2 days in a row), I seem to get up to lots of stuff. I did one small cleaning job this morning. I like to do that; moving about helps to wake me up. Then, I made healthy blueberry oatmeal muffins. They have oatmeal, hemp hearts, applesauce, blueberries, walnuts, and almond milk. Yummy. Here is the link to the blog and the recipe. I've got another small pot of pea sprouts going by my kitchen window. I snipped a few for the top of my salad. While I was photographing the pot of shoots, the female hummingbird showed up. The iridescent colors on their wings are amazing. We don't usually see the males with the shiny red throats at first. This afternoon, I had to do some more mundane sewing, but then I did another patch of thread lace for the foam on my surfing piece so that I can get to finishing it up. I switched to a heavier thread which, once done, I noticed that it was a little yellower than the finer one. I was about to stitch over it when I remembered that the bobbin was white, so I can just flip the pieces over. I never tire of the ever changing view "through my window". 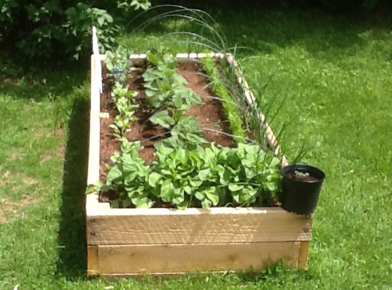 My raised bed is growing! There are beans, carrots, Brussels sprouts, a few beets, beans, and onions. It's been almost 3 weeks since our anniversary when my husband gave me roses. I've kept them because I find they're just as pretty as they dry. Lastly, I've been knitting away on another baby afghan. This is the second one that I've done from the blue cotton that I unraveled from a sweater. 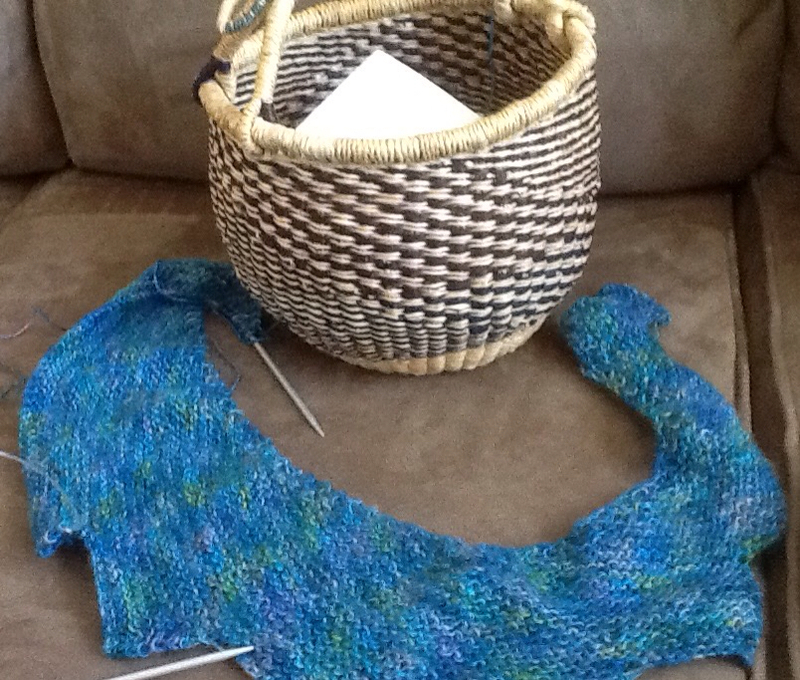 The pattern is Feather and Fan and it is fun to knit! I just hope the mothers will appreciate that it should be cold water washed and hung to dry! All in all a good day. 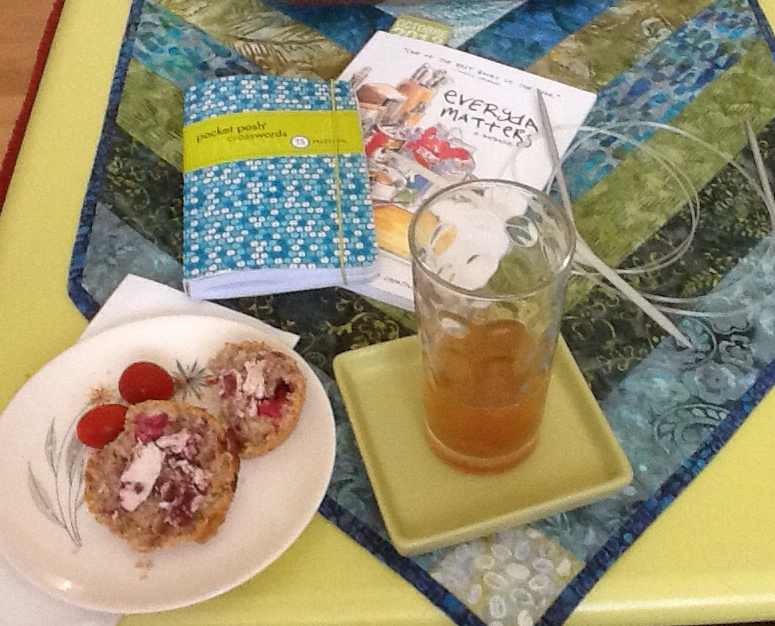 Now, I must take a snack break and sit to finish the binding on a baby quilt. My niece has just had her little girl, Maggie last night. I need to finish it and get it mailed. When you're by yourself for meals, do you eat well? I don't always enjoy the mundane--ness of everyday cooking, but I do like to cook healthy. Even though my husband is away, I arose this morning early due to the bright sunshine and felt like making eggs. They turned into a veggie omelet for one. 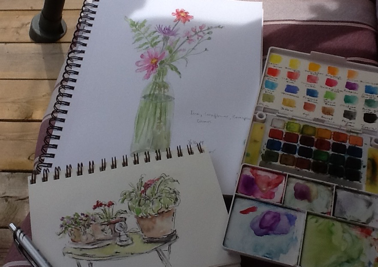 After breakfast, I took my tea and the crossword out to the deck and then I did a bit of catch up stuff in my studio. One thing I really wanted to get done was to get my tulip piece up on the wall where I could eye it for a few days in order to make the final edits before oi head to the machine with it. I love the Lite Steam a Seam 2 because once you peel the paper backing off it sticks but is moveable until it gets ironed into place. After lunch, I did a quick errand and then went on to my in laws for a short visit, dropping off a couple of extra little tomato plants. I've been busy in the garden the last few days getting all my vegetables in. That meant today I could get to the perennial beds top finish the weeding and mulching. I was weeding away on the right section of my bed at the back fence when I looked up and just happened to notice this face peering at me. I saw one of the swallows on the power line this morning, but wasn't sure if they were using the house. They have been quieter. I guess that explains it! I moved over to the other side of the yard and did some weeding and mulching there. As I was walking away to put away the tools, I spied a quick movement. The gold finches are using the recycled glass bath that I made last year. This one is special because I stuck a solar light in the milk glass bowl section and it glows at night. My birdy friends are popping up all over. 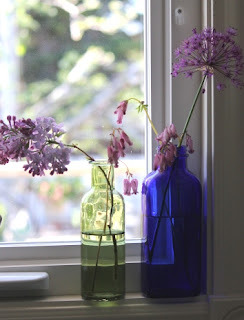 I was taking a picture of my windowsill with the colored bottles and the flower stems that I had just picked when the female hummingbird showed up at the window feeder. This is proof that contrary to my husbands fears, I did not kill the old apple tree when I lopped off all the top of it while on snowshoes this spring! I've also been trying to get back into my habit from last summer of doing little sketches of the bits and pieces that I pick up along the trail, the beach, or from my yard. I did this one at lunch time. I'm starting to droop and I can see why after everything I did today! It's time for me to call it a day. I'm going to soak and settle in to find something to watch while I knit.